Can you imagine lush cascading mountains as a backdrop to a breathtaking coastal escape filled with magnificent cliffs and valleys, waterfalls and turquoise ocean, rainbows, pods of dolphins, grand sea turtles, and a Milky way star-filled evening sky? Welcome to my world on the Hawaiian Island of Kauai, where the Na Pali coast can be experienced only by helicopter, boat or foot. Rated as one of the top greatest hiking adventures in the world with a difficulty level 9 of 10, Na Pali leads the adventurous soul to the infamous Kalalau Valley. The valley itself is home to a beautiful mountain waterfall connected to a river with sacred ponds, big pool and meandering tidal pools through a vast wooded multi-terrain forest. Kalalau’s beach is considered to be one of the most beautiful beaches in the world, nestled against the valley with it’s own waterfall, soft gold sand, hidden caves and camping grounds. My most recent travel to this paradise was with a group wanting to experience the Na Pali every way possible. 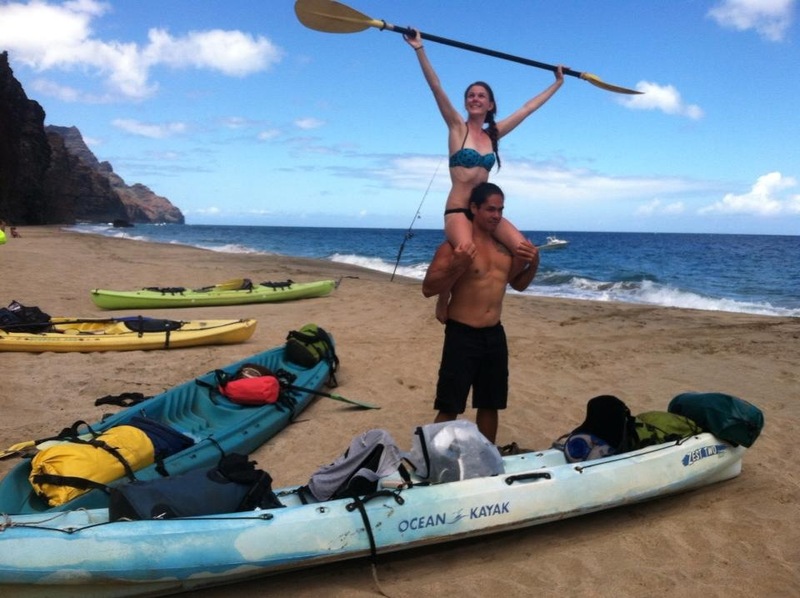 With only 10 days, we opted to take it all in by driving to the top of Kalalau Valley, kayaking the full Na Pali coast, finishing it off with a four day camping adventure. We drove to the western side of the island where we headed straight to the top of Koke’e mountain. Arriving at Kalalau Lookout, we took a hidden foot path that led us directly to the 4K foot view of the valley with it’s cascading mountains. 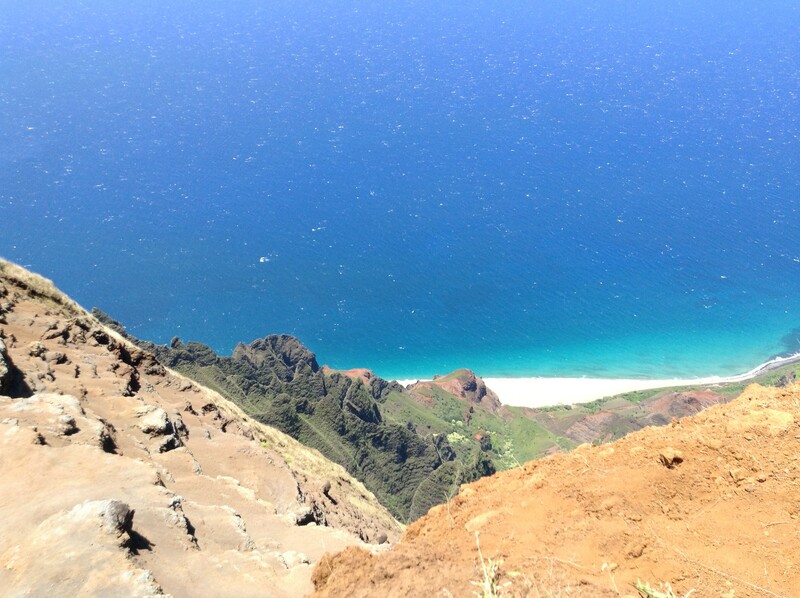 We could see Kalalau’s beach below, beckoning us to the next part of our Na Pali experience. 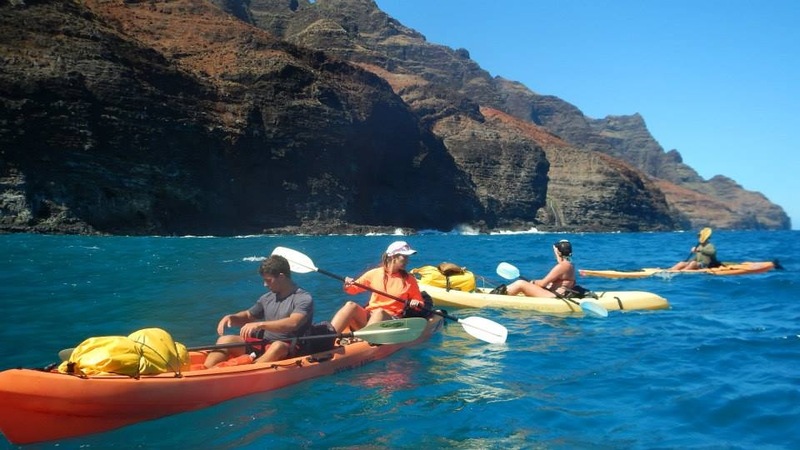 We headed north, to Ke’e beach where we launched 8 kayaks for our three day coastal experience. We hugged the coastal cliff side, paddling past never-ending mountains, waterfalls, caves, and reef, moving in rhythm with the ocean’s current. Tropical birds greeted us from above while sea turtles swam below. 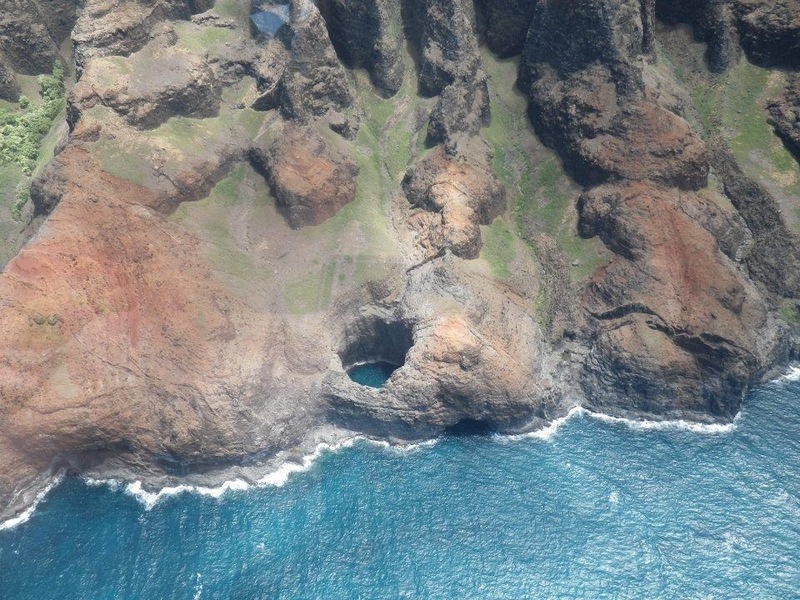 In less than two hours, we were landing at Kalalau beach and setting up camp. We went up valley to the big waterfall and swam in the sacred ponds along the way. We showered by the beach, at the smaller waterfall, taking witness to the glorious sunset as the stars began to fill the sky. 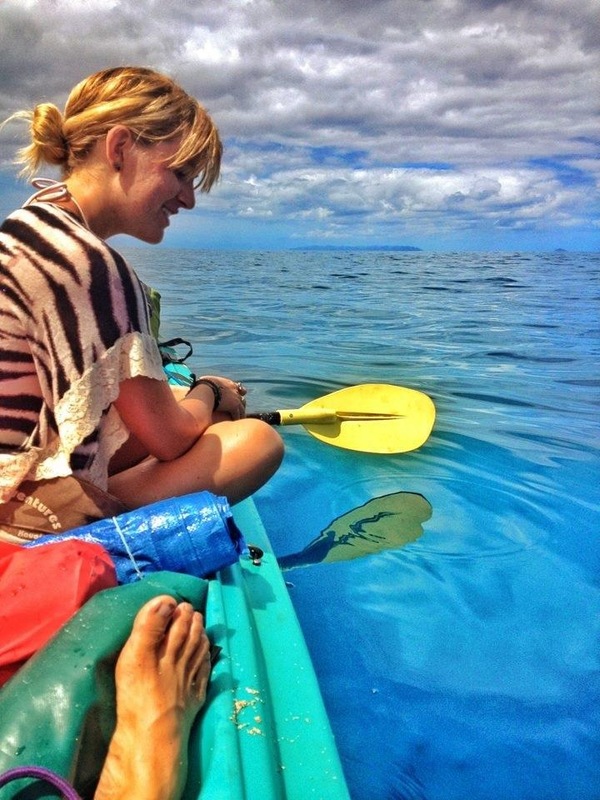 We packed up our kayaks and continued on to the Miloli’i valley, setting up camp and exploring the grounds there. We met up with some local hunters and fishermen who later shared their tasty catch of the day. We explored the valley, going up river to the big open mountain where some of us climbed while others relaxed by the river. Kayaking the remaining Na Pali coast to Poli hale Beach, the seas were calm, so we took our time meandering through the caves. 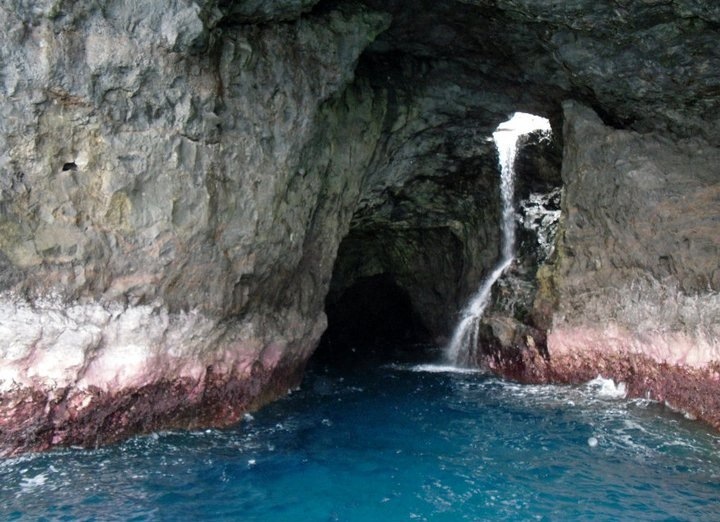 More time was spent at the open-ceiling cave with its beautifully textured walls and sea colors. 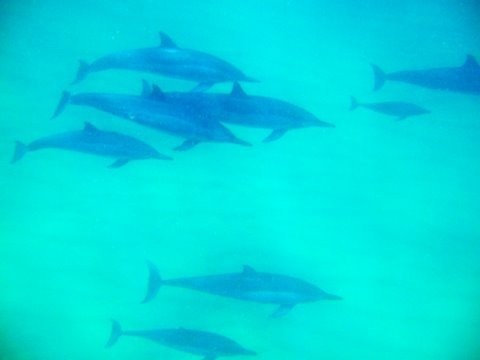 We continued on, passing a pod of spinner dolphins and found a spot to snorkel. We ended this part of our travels at Poli hale beach where we swam in the beautiful sea. 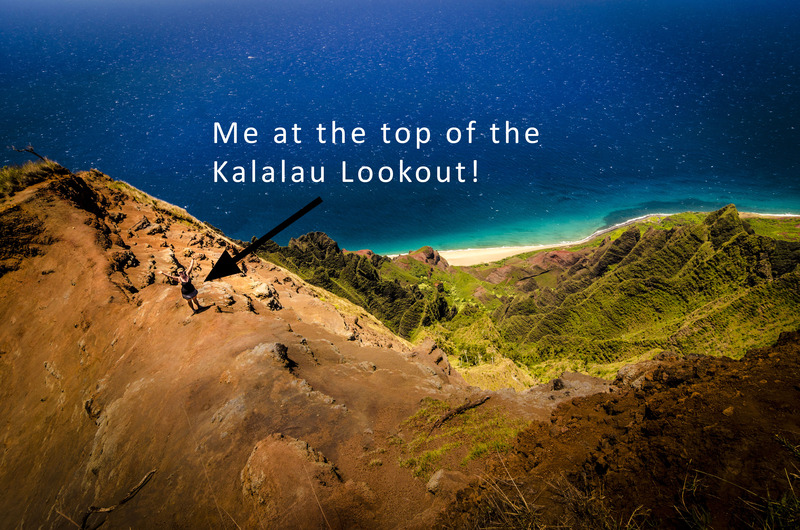 We had witnessed Na Pali through our camping kayak adventure and our excursion to the top of the world at Kalalau valley. 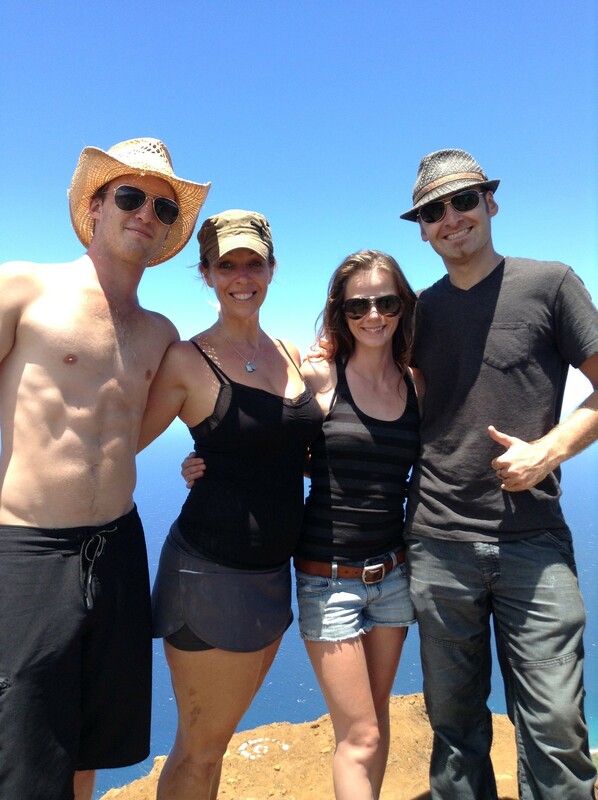 Our appetite was now wet and wanton for the main course: Hiking the Na Pali Coast 22 mile round trip trail. So, we did what any smart person would do in this situation, we caught up on rest and fueled up on energy knowing full well what to expect next. We made it to the Kalalau trail head at 7AM and began our hike of steep inclines and declines over rock laden paths and ever changing valleys. The water below glistened and hues of blue changed as the ocean connected with the horizon and beyond. With switchbacks galore, we met fellow travelers along our way, offering some fresh watermelon juice and advice to one man who had acquired a bout of heat stroke. We met others and offered assistance for crossing the infamous ‘crawler’s ledge’ – a spot where many have shed tears, facing deep fear while passing over the sweeping ocean cliff side, often having strong crashing waves below and heavy winds to boot. At Crawlers’, we took one step at a time, remembering to stay low to the ground, keeping sure footing. Our group finished this hike in eight hours time, taking breaks at each river crossing, stopping for photos along the way. We nestled into the daily rhythm of caring only for the simple pleasures of life: sunrises, campfire meals, relaxing hammock naps, carefree exploration and group gathered sunsets. The tide was low and the beach never ending so we ventured out to explore the caves, while heading to the end of Kalalau beach. A few strong swimmers snorkeled over to Hono pu. We walked under the Big Arch and up the mountain to the waterfall where we enjoyed pounding fresh cold water for drinking and swimming. Waking at sunrise, after making some coffee and tea, we set out for the jungle to find the labyrinth, community gardens, and taro patch fields. We were invited to celebrate one man’s 73rd birthday in potluck-community-style with drumming, singing and talk-story. Our bags were ready by the time we went to sleep on the beach. We took witness to shooting stars and everyone shared their experience from the splendor of the gifts received from Kalalau. We were up at 5AM and set off on our hike back, just after breakfast and saying our last good-byes to all the people we met. Our packs were lighter and the shade was on our side so it came of no surprise when we made it back in under 7 hours. Our Na Pali coastal hike offered an array of treasures including fruit, fauna, rivers and wild life. Fruit consisted of liliquoi (passion fruit), coconuts, mountain apples, mango and guava. Plant and fauna consists of Lau hala bush, Tea leave plants, palm trees, Pili grass, Awa awa puhi ginger roots, fern, moss covered rocks and vervain edible flowers. We crossed the three main rivers: Hanakapi’ai, Honakoa and Kalalau and we spotted goats along the way. 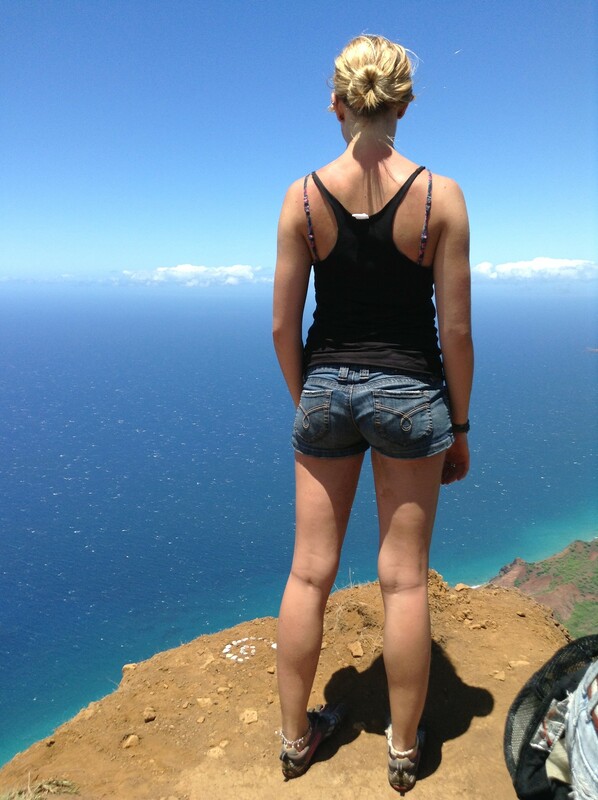 For some, Na Pali coastal hike is a bucket list dream. For others, the hike and camping adventure is a yearly must do. Yet, there are others, like me, who make the trek whenever possible. Nothing can truly paint the vivid backdrop of this magical paradise. It can only be witnessed in person.